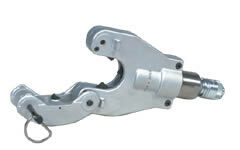 UC-6FTH2 Hydraulic Compression Tools: Izumi Products. 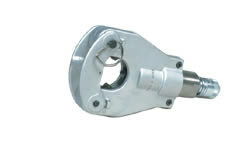 The UC-6FTH2, dieless anderson type head, has a flip top opening and a pull pin locking mechanism to accept the larger connectors up to 750KCM. Larger cables can be inserted and removed by opening the flip top head. Output force is 5.6 metric ton, and a 700 bar or 10,000 PSI external pumping source is required.